Passover commemorates the story of exodus, and the liberation of the Israelites, from 400 years of slavery, celebrating the biblical account of their redemption and escape nearly 3000 years ago. It’s a holiday that is central to Jewish life and history. And it’s more widely observed than any other Jewish holiday. The word “Passover” is derived from the Hebrew word “pasach” which means “passed over”, and refers to a plague (10th plague) that killed the Egyptian first born but miraculously “passed over” the homes of the Israelites. After the plague, Pharaoh finally agreed to free all the Israelites and permit them to leave Egypt. The need to leave in a hurry didn’t allow the Israelites enough time for their bread to rise. So they baked unleavened bread, now commonly known as matzoh, for the journey. People of the Jewish faith gather together with friends and family, every spring, to celebrate freedom and remind themselves that since they were once slaves and found freedom, they must always work for freedom for all people everywhere. 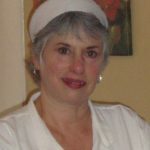 Passover is observed for one week (7 to 8 days) each spring, based on the Hebrew calendar, and has been celebrated in many ways, throughout history, including observing remnants of ancient Pagan spring harvest festivals that are also celebrated at Easter. Passover became a more family centered and communal holiday around 500-600 C.E. The matzoh represents the haste in which the Israelites left Egypt. Leavened breads and grains are removed from Jewish homes during Passover and substituted with matzoh and homemade or purchased baked goods made with specially prepared Passover ingredients. Matzo bread next to Passover Seder Plate with The seventh symbolic item used during the seder meal on passover Jewish holiday. A Passover “seder” plate, containing small pieces of symbolic foods, is placed on the table. On the first night of the holiday, a dish of salt water (tears) and wine (blood) accompany the seder plate for the ceremonial meal. 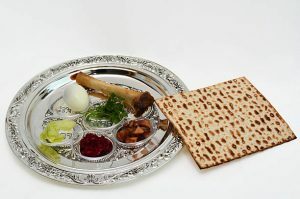 Each item on the plate: matzoh, bitter herbs, lamb shank, roasted egg, sweet herbs and haroset represent an aspect of the Passover story. Passover 2019 begins at sundown on Friday, April 19, and ends Saturday evening, April 27. And, as with all holidays, both religious and secular, food and feasting are an important part of the scenario. Here are two of my favorite inexpensive, quick and easy Passover recipes. Haroset represents the mortar Israelites used to make adobe bricks when they were enslaved in Egypt. A Sephardic style consists of figs, dates and raisins. This recipe is a European version, and very tasty. 5 medium eating apples, peeled, cored and diced by hand. This is so good, and basically a Jewish version of a traditional “egg and bread” breakfast. 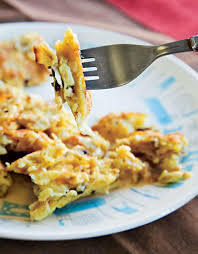 *To prepare a sweet version, omit the scallions and drizzle honey over the finished scramble.